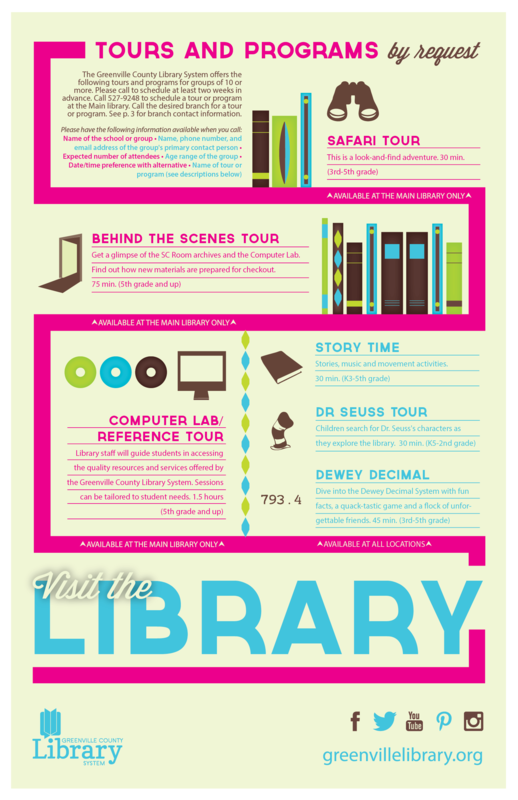 Greenville County Library System has a graphic designer on staff, and it shows. Everywhere you look on Greenville’s web presence, though, you’ll see the touch of a graphic designer – from the Library’s logo, to the icons on the webpage, to the Library newsletter. Ad/Lib reached out to that designer, Michelle Hannon, to showcase some of her work for the Library. What you see below is a subset of that work, some of the posters Michelle has produced to promote Greenville events and services. For some of the work featured below, Michelle has provided Ad/Lib with some descriptive text. You can see some of Michelle’s other design work on Behance and Flickr.